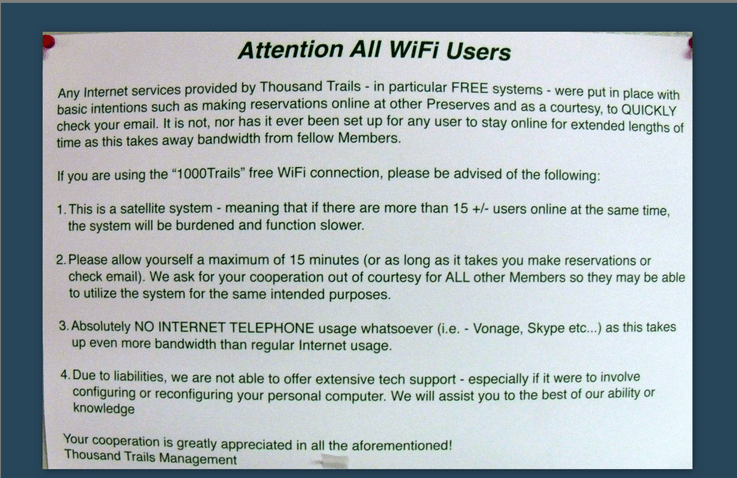 Geeks on Tour Newsletter Oct 2010: Unlimited Internet! October started with a family cruise on the Alaska Inside Passage. See all our pictures on our Picasa Web Album – it was a beautiful trip. We even survived a whole week of being offline with our computers. Although we did get enough Verizon connection in Juneau and Skagway that we could check email on our Droid cellphones. Hey! You never know when a million dollar offer will come thru and require an immediate response! Picasa tip: Who took that Picture? Picasa tip: What does that Symbol Mean? One of our most popular topics in Computer Education for Travelers is how to connect to the Internet on the road. If you’re an Internet user at a stick and brick type of home you probably have DSL or Cable for an always-on, dependable, and fast connection that you take for granted. What’s the difference between wired Internet connections at home like DSL and Cable … and wireless Internet connections as you travel like Wi-Fi, Cellular, and Satellite? Although DSL and Cable can come with different speed options, they are usually quite fast. And, whatever speed you get is dependable – it doesn’t change from day to day. Some wireless connections are also very fast. A 4G cellular connection can even be faster than DSL or Cable. We’ve also experienced some Wi-Fi hotspots that were lightning fast when nobody else was using it. But you can’t count on it. The same Wi-Fi hotspot that was lightning fast on Thursday may slow to a crawl over the weekend when the park is full. Your speedy Verizon connection in Cincinnati may be barely usable in Lubbock. Wired Internet services like DSL and Cable usually do not specify any limits. You can be streaming many gigabytes of data across the wire all day every day and there is no extra charge. Wireless is a different story. There’s not enough of it to go around in an unlimited manner, so the providers either charge extra for overages, or they ‘throttle’ your connection after a certain point. Satellite providers use the throttling method – if you go over your allotment (usually about 350 MB per day) your connection will slow down to less than dial-up speed. You will still be able to get your text email, but that’s about it. Most cellular plans limit usage to 5GB/mo. AT&T’s standard plan now only allows for 2GB/mo. If you go over there are charges per every Megabyte that you use – it adds up! As noted above, most cellular data plans have usage limits, but there are a few notable exceptions. Tethered Droid cellphone with PDANet. See this video for a detailed explanation of how we use our Droid cellphone tethered to our computer for an unlimited data connection. The drawbacks to this method are 1)you can’t talk on the phone and browse the web at the same time, 2) it’s cumbersome to have to cable your phone to your computer, 3)this is not supported by Verizon and 4)it can’t be shared – not easily anyway. 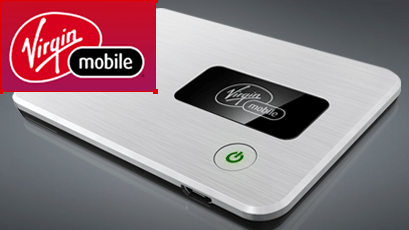 Virgin Mobile’s Broadband2Go MiFi device.We will probably get one of these when we hit the road again next summer. For $40/mo you get unlimited data with no contract and a MiFi device which provides a wireless connection for up to 5 computers. What’s the catch? It uses the Sprint network – coverage is an issue. Verizon has much better coverage. But, we figure between the Virgin Mi-Fi and our tethered Droids, we’ll be well covered. Old cellular data plans that you are ‘grandfathered’ to. If you have an unlimited data plan as part of your cellular contract – don’t give it up! It’s worth gold! Most people are fine with 5GB per month. You can read all the emails you want, surft the web and even make a few Skype calls and stay well within that limit. According to Wired – AT&T says that 98 percent of its smartphone customers average less than 2 GB per month. I do video production and I need to upload those videos to the Web. One video can be 100 MB. I also use Carbonite for online backup of all my files, including videos, so one video can represent 200 MB of data usage before I even watch it online! We also prefer the Internet to TV. We are parked for the winter in a park that has a phone cable to each site, so we signed up for $19.95/mo DSL service, and we are getting SOO spoiled. No need for TIVO, I can watch every episode of The Daily Show, or House, or Lie to Me by visiting Hulu.com . I can even watch entire seasons of 24 or Stargate SG-1. And, now that Netflix offers Instant Viewing movies – over our Wii console which is connected to the big screen TV …. well, I think you see the point. With unlimited, fast Internet connection – the TV is quickly becoming obsolete. If we had a limit on our Internet usage, it would really cramp our style! We’ve added a topic to our Forums specifically to discuss unlimited Data connections. If you’re a Geeks on Tour paid member, please visit and leave your comments. Even non-members can view the forum to see what’s going on. The new Geeks on Tour Website includes Forums that anyone can view. Only paid members can ask a question, but you can read the questions and answers whether you are a member or not, so check out some of the hot topics listed below. If you want to ask questions and you’re not a member, you can join here. The Droid cellphone is still our favorite gadget. We absolutely do not go anywhere without it. Many of our Geeks on Tour members also have the Droid, so we have a forum specifically for the Android phones. Hot topics include: Internet connection by Tethering the Droid, and Must Have Apps. Picasa is still our most popular topic, and you can tell that from the forums. Browse the Picasa forum to read about Using Picasa Web Album photos for your Gmail contacts, or making a DVD of pictures and movies, or the difference between renaming and captions. Published by MrsGeek, in Newsletter. Tagged with Facebook, Geeks on Tour, Geeks on Tour Forum, Macintosh, Picasa Uploader, Virgin Mobile MiFi.